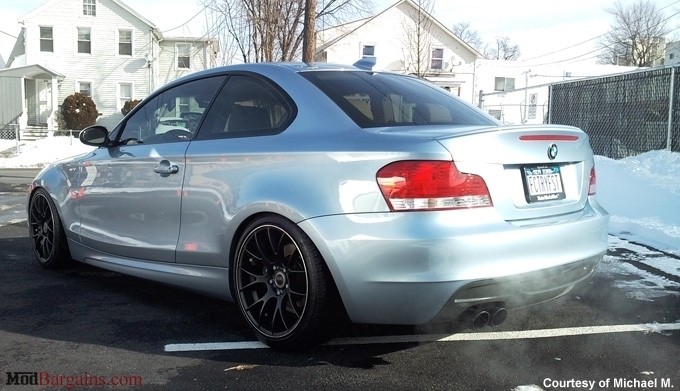 The KW Street Comfort Coilovers for the E82/E88 2008-2012 BMW 128i and 2008-2012 135i feature height adjustability and T.U.V. approval with a Lifetime warranty. Out corner other boring cars but still have maximum driving comfort!! Get rid of the monster truck look with lowering on front and rear axle from 0.8"-1.6"
Looking to upgrade your 1 Series' suspension with full height adjustability but don't want to kill your comfort level with conventional coilovers? KW have just what your looking for with "KW street comfort“ KW has produced a newly developed coilover suspension line which allows individual lowering with the best driving comfort possible. The KW Street Comfort Coilovers allow you to lower your 1 Series anywhere from 0.8" to 1.6". Therefore it offers a perfect look, with the best possible driving behavior. Long distance, motorways as well as fast driven country roads will be a pleasure for every driver. KW street comfort in stainless steel technology “inox-line” are developed especially for ambitious customers which demand comfort, safe driving quality and a discreet but individual lowering. The vehicle can be height adjusted from 0.8"-1.6" on front and rear axle. 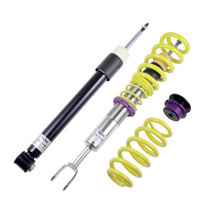 All coilover kits are equipped with a shock absorber which can be adjusted in rebound damping for more comfort.